Talking about basketball games on Android devices is doing it from NBA Live Mobile. The game of EA is a whole beast that has no competition in its own: bring the excitement of basketball to the screens of smartphone and tablets. As has happened with FIFA Mobile the second season has reached NBA Live Mobile with a few novelties that will improve the gaming experience much more. There are several fields that have been remodeled tremendously in this new second season and we could almost be talking about that we are facing a new game. One of the facets that has changed the most has been the alignment: if before we had a mess with the five different ones now we will only concentrate on two the NBA line-up (which has the current players) and the classic one (where there are the legends of the world of basketball). In addition the MED of the bench will be fundamental in the good course of the team. 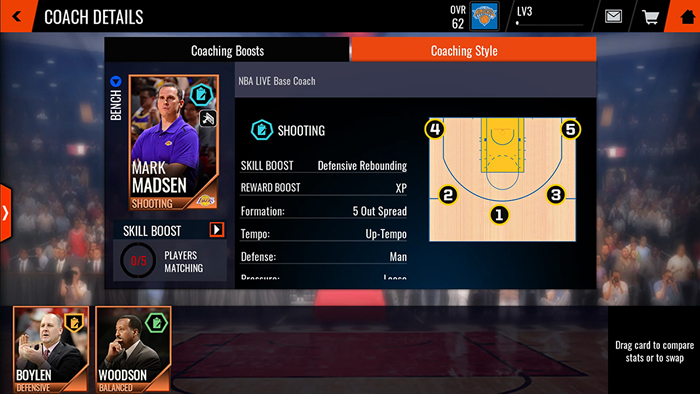 This new system of alignments is completed with the inclusion of one of the most revered figures of the NBA: the coaches make their appearance in NBA Live Mobile and we can unlock them as if they were players. These coaches have a great weight in our way of playing since each of them have a different training and playing style which will improve our team players. Of course we must bear in mind that not all players are well married in certain styles so we can always see which coach favors our team better and vice versa. 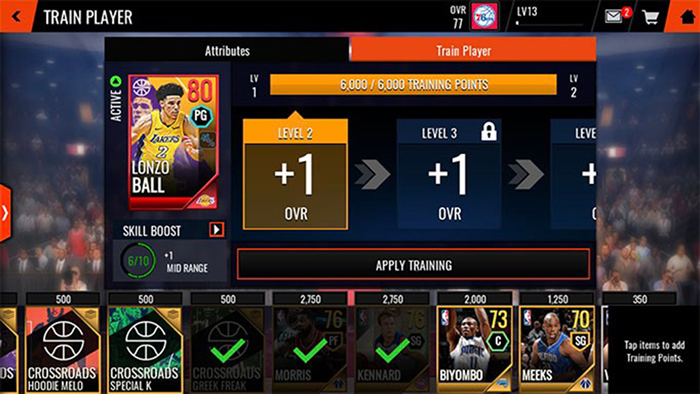 This second season that has just started has more relevant news that will change the way we played NBA Live Mobile and if we used to talk about coaches the normal thing now is to do it on training. Like his namesake soccer fan we can now improve our gold and elite players through the use of other players or special training collectibles. The game will no longer be based solely on the traditional exchange of cards but we can give greater importance to players of lower average. The Crossroads program (crossroads) is another interesting novelty with which to live new events based on players who are at an important point in their careers. Thus we can play 30 challenges with which to acquire these players who be it for being a rookie or being a veteran star this season will mark the evolution of their careers. The list of players we can incorporate once we have made their challenges are: Lonzo Ball Giannis Antetokounmpo Carmelo Anthony Dwayne Wade and Karl Anthony Towns. NBA Live 18 is a basketball immersive video game developed by EA Canada published by EA Sports in 2017. Unveiled information revealed the game features abundant new content which is totally different from its predecessor the NBA Live 16. There’s a chain of game modes for gamers: The One Franchise Ultimate Team corresponds to career mode quick mode and online mode of traditional sports game. Full of innovation! NBA Live 18 Coins is the eternal theme among Live 18 gamers. You grind with the matches or challenges to accumulate NBA Live 18 Coins from scratch but it’s not a joyful way to enjoy the game’s interest. Even best veteran of the game series will complain about the difficulty to earn coins so we mmocs.com now provide a cheap and safe way for our customer to buy NBA Live Coins. Now the NBA Live 18 Coins is on sale!